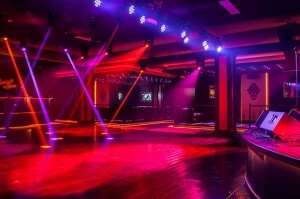 USA – December saw the opening of Rumba Room Live, an upscale Latin-themed nightclub and concert venue in Anaheim, California. 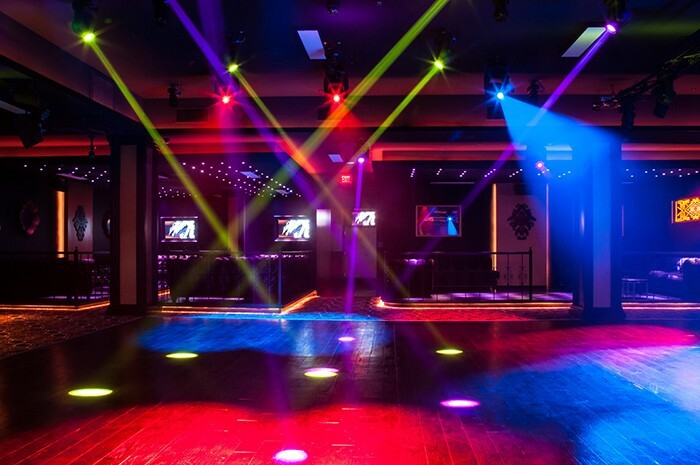 Located at the Anaheim GardenWalk and built new from the ground up, the club, which features state-of-the-art Elation entertainment lighting and video systems, has energized the nightclub scene in Anaheim. The 10,000 square foot venue has the flexibility to host 1,000 people and hold a variety of events yet maintains a chic, intimate feel. Downlighting the Rumba Room Live facade in a wash of customisable shades are 12 Elation SixPar 200IP colour changers, weatherproof fixtures with six-colour LED multi-chips. They allow for a nearly infinite range of colour choices, meaning the venue can tailor the outdoor look to match any event or express any mood or emotion. 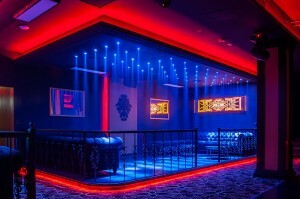 “We wanted to really create a sensual yet inviting look and the SixPars do the job perfectly,” stated Ramon Chavez, VP of business operations at the club, who helped oversee construction and operations. Betancourt adds that the SixPars were chosen not only for the vibrant colours they offer but for the punch they bring, alluding to the output from the fixture’s 12 x 12 Watt LEDs. Stepping inside, the lighting scheme begins in the lobby where the interior glass is downlit using seven Elation one-meter long ELED QA Strips while Elation Flex LED Tape WP downlights the box office counter. The exterior and lobby areas are controlled by an Elation ART500 touch-panel DMX wall controller, an easy to navigate control system with preset scenes for simple colour changes. 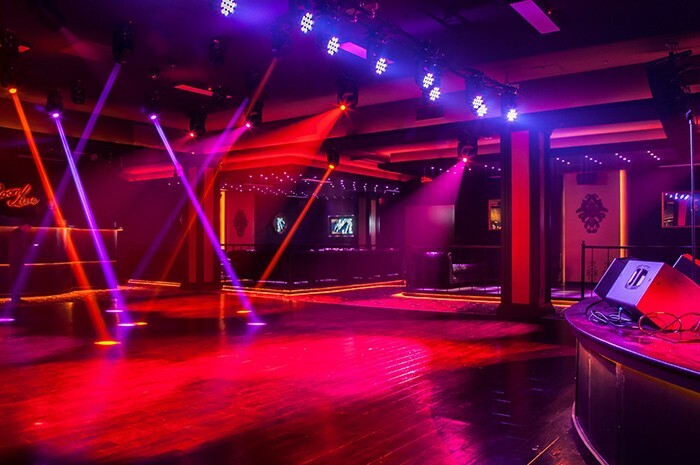 Moving into the club, guests are greeted by a 4 x 3 LED screen made up of 12 Elation EZ4 video panels, the first of four Elation LED screens in the venue. The EZ4 are high-resolution 4mm pixel pitch panels that create sharp, stunning imagery from only a few feet away. With an array of vivid colours and 1,200 Nits of brightness, they are ideal for running video and graphics. 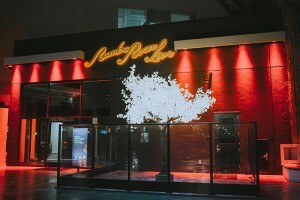 The entry screen at Rumba Room Live is controlled by via Arkaos Media Master and is used to display the club’s logo and images of upcoming events. From the bar area, Elation Platinum Spot LED Pro II moving heads lead guests to the dance floor and stage, where the full impact of the visual scheme is felt. Most noticeably are three LED screens made up of 32 Elation EZ4 video panels, a large 7 x 4 centre screen and two smaller 1 x 2 screens placed stage right and left. Control is again by an Arkaos Media Master. Above the dance floor is a rig of ten Platinum Spot LED Pro II moving heads, eight Rayzor Q7 LED moving heads, and eight Rayzor Beam 2Rs, small and fast colour- and gobo-changing moving heads with more than enough power to cut through the other lighting. Also in the rig are four Sniper 2R multi-effect lights, Elation’s unique beam, scanner and laser simulator in one, as well as a pair of SixPar 200 LED Par colour changers. Accenting the DJ booth is decorative Flex RGB Led Tape. For stage lighting, 12 compact Rayzor Q12 Zoom LED wash moving head lights work from a downstage position with 15 upstage SixPar 100 LED Par lights and 6 Platinum Spot LED Pro IIs upstage and stage left and right. Used for upstage washes of even colour are 12 CuePix Tri Strips with eight Sniper 2Rs providing upstage effects. Flex RGB LED Tape is used to highlight the stage border and atmospheric effects come from a pair of Antari F-5D Fazers. Rumba Room Live has enlivened the entertainment scene in Anaheim with a quality dose of Latin culture. The club’s formula of playing the best in Latin music while hosting live performances across a variety of genres has proved popular since opening late last year.